OR: HOW CAN I MAKE THE BEST USE OF LIMITED DESIGN AND DEVELOPMENT BUDGETS IN THESE INCREASINGLY CHALLENGING ECONOMIC TIMES? Most of you are building sites that cost your client more money than they should. You’re wasting money. Here’s how you can stop. HARDER It’s no secret that we’re in a period of global recession. Clients either have smaller budgets, or want more from the same budget as before. Companies who employ web designers and developers have less work, which may mean they’re unable to support as many sta ! . Everyone has to work harder. FA S T E R CHEAPER BETTER STRONGER WITH FEWER RESOURCES AVAILABLE What we build has to be done faster Spending less To higher standards because the market is more competative and has to last longer. All this will fewer people on your team, or less money to pay for the number of hours you may require as a freelancer. Today I’m going to be looking at some techniques that might help you to design and build faster, cheaper, better and stronger. SOME TECHNIQUES ARE TECHNICAL BUT MANY ARE ABOUT WORKFLOW Some of those techniques are about the technology we put in place. A lot of what we do on the web is technical and by identifying the costs associate with technology we’re using we can make sure we’re as e " cient as possible. One of the biggest costs in building stu ! for the web is you and me. It’s people’s time. So a lot of the suggestions are about improving workﬂow. About thinking about our jobs in terms of e " ciency. HERE’S THE TIPS PRESENTED IN NO PARTICULAR ORDER So these are my tips, in no particular order. Yours may be di ! erent - I encourage you to share them. You might not agree - that’s ok! The important thing is that you think about how your can improve the way you spend your client’s budgets. 1 WRITE A COMPREHENSIVE SPECIFICATION FOR YOUR PROJECT WORKFLOW. When we’re talking about e " ciency in design and development, we need to talk about speciﬁcations. Most of us don’t like the concept of having to produce a spec It’s outside of our skills, often. IS IN - THE SPEC If budgets are tight, the easiest place to control the costs is in the spec. When the spec is still being written and reﬁned, making changes, cutting back features, or juggling where time is best spent. When budget is limited, you need to make sure money is being spent where it matters. At the spec level, changes are almost free. Once you’ve started building, changes are expensive, and it’s money you can’t a ! ord to waste. So what should be in a spec? FROM THE USER’S PERSPECTIVE NOT HOW IT’S IMPLEMENTED A good spec simply describes the site from a user’s point of view. What do they see? What can they do? A picture paints a thousand words, so include sketches of the interface. (where it matters) These aren’t designs. By thinking about what the user can see and do, you’re describing what needs to be designed and built. Include all users - such as sta ! admins, content editors, moderators as well as punters. This helps you make sure you’ve thought of everything, and time to design and build can be estimated accurately. CHANGES ARE CHEAP TO M A K E ON PA P E R Don’t be afraid of changing the spec at this stage. Changes are cheap. Changes for the better save you money. CAN BE - PLANNED UP FRONT Once you’re working to a ﬁnalised spec, it gives you a world-picture of the project. As a designer you might be designing something like a User Badge. With a spec you can look through and ﬁnd all places it’s used and make sure your design accommodates it. As a developer, you might be building something like a Pagination class. By having a spec up front, you can ﬁnd all items that need paging, and make sure your class is ﬂexible enough for all those uses. It enables you to be more e " cient. NO - SURPRISES It should basically mean that there are no surprises. Or at least the surprises are minor and easy to deal with. A spec enables you to make sure any additions can be correctly charged for. It helps you make sure that a job continues to be proﬁtable. That helps make sure you’re around to work on the next project. THE WHEEL There are unique projects - but for each one there’s 1000 that are fundamentally the same. Don’t be afraid of using technology you haven’t developed yourself. There are lots of web application frameworks There are lots of content management systems A lot of those are free Some of them are even good. Building on top of an existing platform can save masses of time. YOUR (NOW SOLID) SPECIFICATION Don’t forget your spec. It’s a great help in evaluating a technical solution. It tells you what any chosen platform needs to be able to deliver. THAN FEATURES? Perhaps you might ﬁnd a system that will allow you to deliver 90% of your project out of the box. MASSIVE SAVING. It’s a good time to re-evaluate the 10%. Is it an important 10%. Is the cost saving from changing the spec worth it? That will depend on your project. Massively. FROM NOTHING It’s always going to be more cost e " cient if you can then build that 10% yourselves Than to build 100% yourself from scratch. 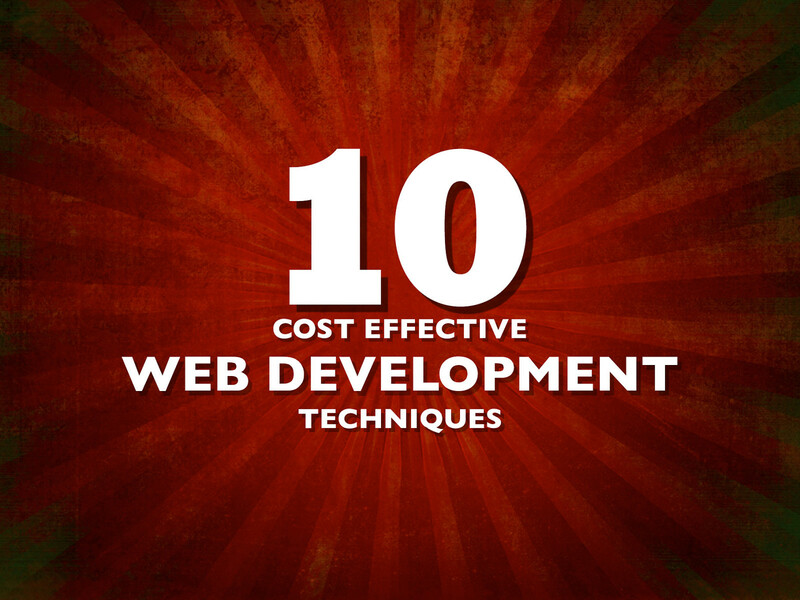 View Cost Effective Web Development on Notist. Times are tough. With private companies and public organisations alike cutting back on spending, the budget for every project is trimmed down to the bone. From the cost of building sites, to maintaining them and even the funds required to keep them online, web designers and developers need to be increasingly creative to do a lot with a little. It's sink or swim - we need to deliver more for the budget or risk losing projects (or our jobs) to more resourceful colleagues. But fear not! There are lots of simple, practical things we can all do to deliver more value to our customers. Drew McLellan will show you how to make the best use of limited design and development budgets in increasingly challenging economic times. Excellent talk by @drewm at #iceweb2010. Who can top that much awesomeness? Ah, @rellyab. #iceweb2010 @drewm "Cheapest place for changes is in the specification of a project". True to that!